NOTE: We lost internet access around 7:30 pm Friday and didn’t get it back until Saturday afternoon, so this posting is late. Temp in the 50s, partly sunny, Wind WSW switching to WNW 20-30 mph. We went over to the Seal Drive feeder to put out seed and discovered, to our dismay, that some moron cut down the smaller of the two spruces that were there! Presumably for a Christmas tree! There are probably fewer that a hundred trees on Adak. How thoughtless!! We checked Sweeper Cove, then got gas (still a bargain at only $6.49/gal!). As we left the gas station, we had a Gyrfalcon fly by. We headed up to the Warbler Willows. The willows were swaying and bouncing strongly in the wind, so no bird dared show itself, except one brave Pacific Wren. At the Adak National Forest (about 30 of the aforementioned trees) we had a Pacific Wren, I also saw another bird disappear into the forest, but I thought it was just another wren. It did not reappear. I walked the Elfin Forest. No birds. At Clam Lagoon, I walked the marsh edge, finding only a couple of Pectoral Sandpipers and a peep which flew away too fast for me to identify. We did not see anything different at the Seawall. Lake Shirley produced our first Greater Scaups of the trip! Were are they all? Lake Ronnie also had two more. On the east side of the lagoon – out towards the middle – we spotted a flock of 12 Sanderlings. We could not pick out any other species mixed in. Back up at the Seawall, things were picking up. At the southern end, Barb saw some feeding frenzies further up, so we drove up and started scanning the flocks of gulls and alcids. We soon discovered the source was a whale. We only got brief views (as is typical for us up here! ), but our best guess is a Minke Whale. While scanning the flocks, I picked up a Pomarine Jaeger, quickly followed by a Parasitic! This is only our second Pomarine that we have seen out here (our first was this spring). We then saw three White-winged Scoters to add to the trip list. 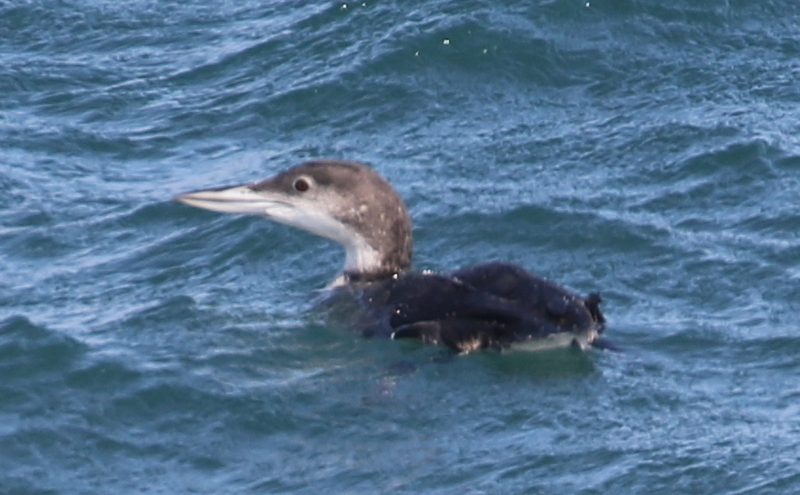 When we were finished scanning the action, we continued up the Seawall and spotted a loon. At first, the pale bill made us think it was a Yellow-billed, but we quickly came to our senses and correctly identified it as a Common. So I decided to walk the marsh edge again. 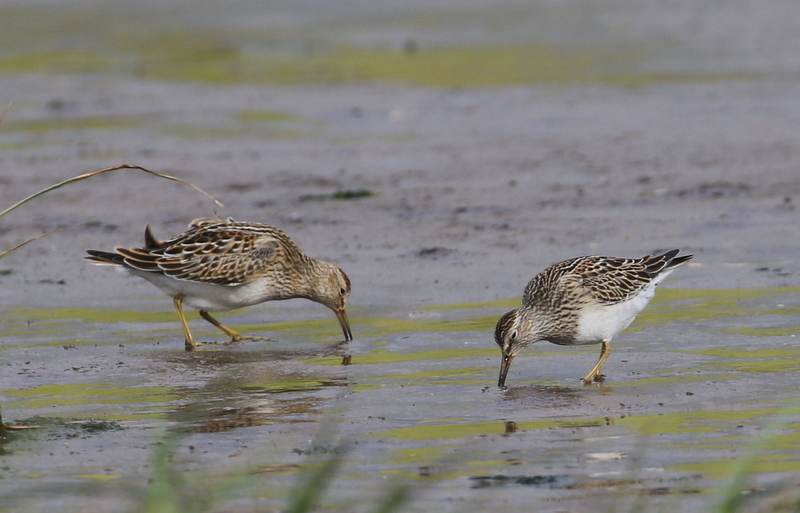 This time, in addition to the three Pectoral Sandipers, I also had a Sharp-tailed Sandpiper. 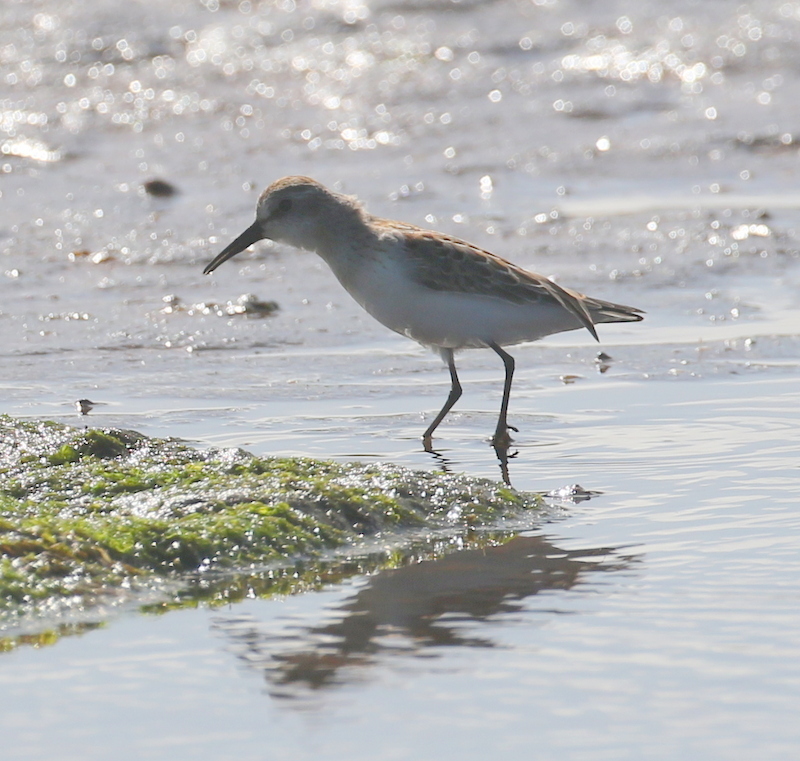 I also finally got a look at the peep that flew away earlier (at least I assume it was the same bird), and it turned out to be only a Western Sandpiper. We headed back south and stopped again at the Adak National Forest. 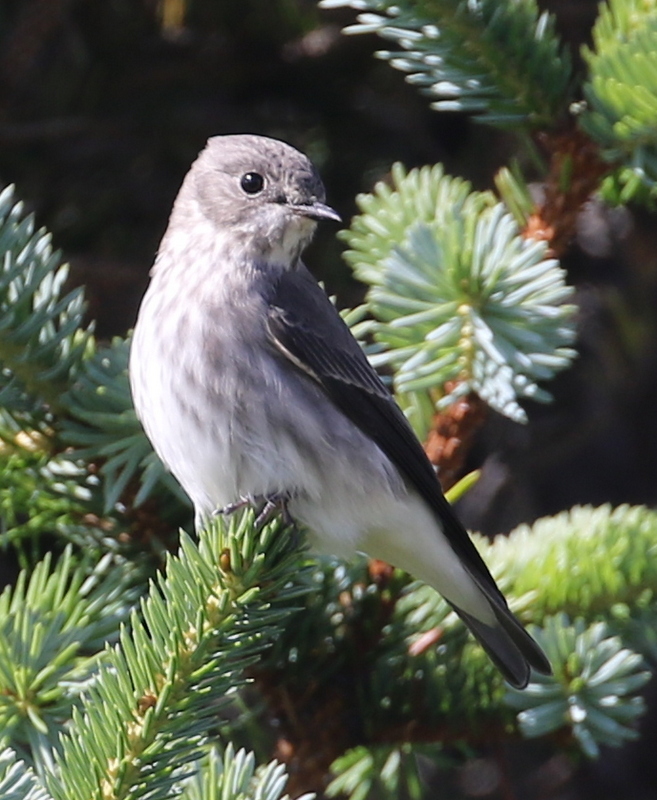 Barb spotted a bird sitting on the willows and said it was our flycatcher from the other day. Indeed it was. 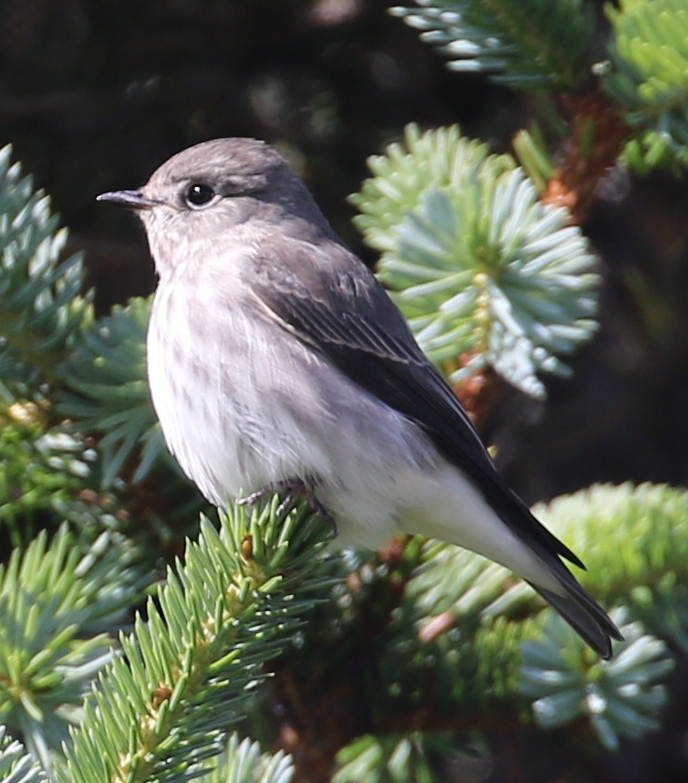 The ANF is less than a mile (as the flycatcher flies…) from the Warbler Willows. It was more cooperative this time and I got better photos. The only other birds of note today were three more Greater Scaup on Lake Leone – which is next to the quarry south of Sweeper Cove. We rarely see any waterfowl there at all. In 2007, we had a total of 90 species for our Adak Year’s List. Since we had 81 this past May, we were hoping to possibly exceed that. However, one advantage in 2007 was having a boat available to go out for the auklets – 5 species of them! So getting to that magic number this year will be difficult — but not impossible. So far, we have added five species for the year – Pectoral Sandpiper, Sharp-tailed Sandpiper, Western Sandpiper, Sanderling, and Gray-streaked Flycatcher. So we are already at 86!